You know what I love? Weird, idiosyncratic versions of famous, iconic cars that only show up in one particular corner of the world. That’s why I’m so smitten with weird South African Beetles and Italian Volkswagen taillights and bizarre Chilean fiberglass Minis. 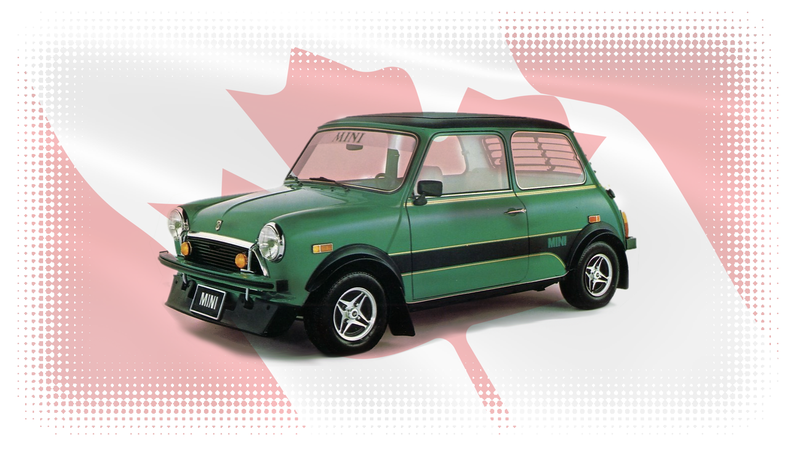 I’m happy to say I’ve learned about yet another one: the Canadian Minis that look like they’re wearing one of those awful orthodontic headgear things I had to wear when I was, like, 14. While Minis were an unqualified global success and sold all over the world, by the 1970s strict new American safety regulations were coming into play that the tiny Mini stood no chance of meeting without colossal re-engineering. The result was that Minis were glumly pulled from the U.S. market. Is this how Canadians dressed in the 1970s? The location of the smog pump also necessitated a change in the radiator so that the inlet was towards the back near the filler cap. ... and, of course, the most obvious change, those bumpers. As you can see, the bumper was different, with a rubber impact strip, it was mounted a good bit higher, along with some strange chrome vertical bumper mounts/overrider things on each side of the grille. The turn indicators were also replaced with larger round units, mounted on the grille. These weren’t really radical changes, but for a car that changed so little over the course of its life, these were pretty major. And only for Canada. The rear also got the same sort of rubber-faced, higher-mounted bumper, along with a solitary, annoyingly just-off-center reversing lamp mounted below the bumper. Also, “genuine plastic mag wheel discs!” Damn, Canada, you know how to live.